OPTIMA specialises in Pre Made Bag Packaging Machines. Over 26 years of experience in the field of packaging machinery makes us most realiable solution provider in the industry. The new pre made bag packaging machine is with the latest technology and highest performance. Product Types: Dry Food, Wet Food, Snacks, Granules, Sweets, Coffee, Bakery, Liquids, Powders, Meat, Hardware etc. Bag Types: DOY Bags, Pillow Bag, Gusset Bags, Zipper Bags. It is a simplified version pouch machine for various pre-made bags such as pillow bags, gusset bags, zipper bags etc. As a cost saving solution, it is an idea for a lot of application such as coffee, frozen foods, cookies, cereals, nuts, flower, candy etc. It can also be interfaced with other equipments for use with turnkey lines. 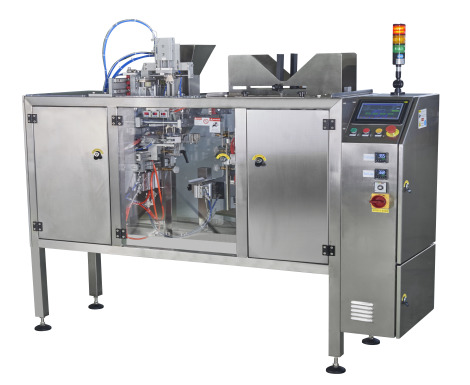 It can be equipped with different dispensers depending on the type of product to dispense: volumetric for granules, auger filler for dusts, piston or flow meter for liquid and doughy, linear and multihead weighers ... etc. As every application is different in this sector we recommend you to contact us to discuss your requirements and we will visit you to understand your requirements. Contact Us to talk with technical experts or to get a quick quotation now. The WL HP1 series premade bags packaging machine is ideal and economical solution for premade pouches. It is a simplified version pouch machine for variety of bag styles, including 3 or 4 sided seal pillow pouches, stand up bags, gusseted pouches and quad seal bags etc. As a cost saving solution, it is an idea for a lot of application such as coffee, frozen foods, cookies, cereals, nuts, flower, candy etc. It can also be interfaced with other equipments for use with turnkey lines. Stand up pouches make ideal containers for a variety of solid, liquid and powered foods as well as non- food items. Premade pouches are convenient as unlike form & seal technology, equipment change over time is not required when using pouches with the same size requirements but different graphics. Food grade laminates help keep your food products fresher for longer and provide significant convenience if a zipper is included while also the ample surface area makes a perfect product branding providing visually appealing graphics. SUBSCRIBE FOR PROMOTIONS Subscribe ! Copyright © 2016 Optima Weightech. All Rights Reserved. Powered By: Barodaweb | The E-Catalogue Designer.